This semester I took a mold-making class. I wanted to learn about the materials and techniques required to replicate 3-dimensional works, ideally so I can make toys or figurines. My initial idea for my final project was to make bobble heads, but as time went on and I really started thinking about the materials, I thought it would be interesting to do something a little different. My initial idea for an individual bobblehead. One thing I have to say is that I had no idea how many different materials there are to work with. There’s all kinds of foams, resins, and rubbers to work with, and each material has its own rules and restrictions. Just the practice of making a mold forces you to look at the object in a whole new way. You have to think about venting, pour spout placement, and parting walls, and potential air bubbles in the mold itself. So much of the process is knowing your materials. Over the course of the semester, I found that despite the fact that molds are meant to replicate one object again and again, there can be drastic variation between each casting. This got me thinking about the nature of replication. A few semesters back, I took a fiber class, where I learned to crochet. Crochet is all about repetition of a single stitch to create a uniform surface. As you might know, patterns exist to guide makers into creating specific forms. Like castings, however, no two works are ever precisely alike. A material that caught my attention early on was something called “Friendly Plastic”. This plastic comes in a container of little pellets, which you heat up and mush together to press into a mold (or you can just sculpt with it). Once it cools, it’s very lightweight. I was surprised by how much detail it could capture. With all this in mind, I crocheted three separate “bodies” as a kind of stream of consciousness exercise. I used Super Sculpey to create five different creature heads, which I then made silicone molds of. I cast each mold three times with Friendly Plastic and attached them to the yarn bodies. 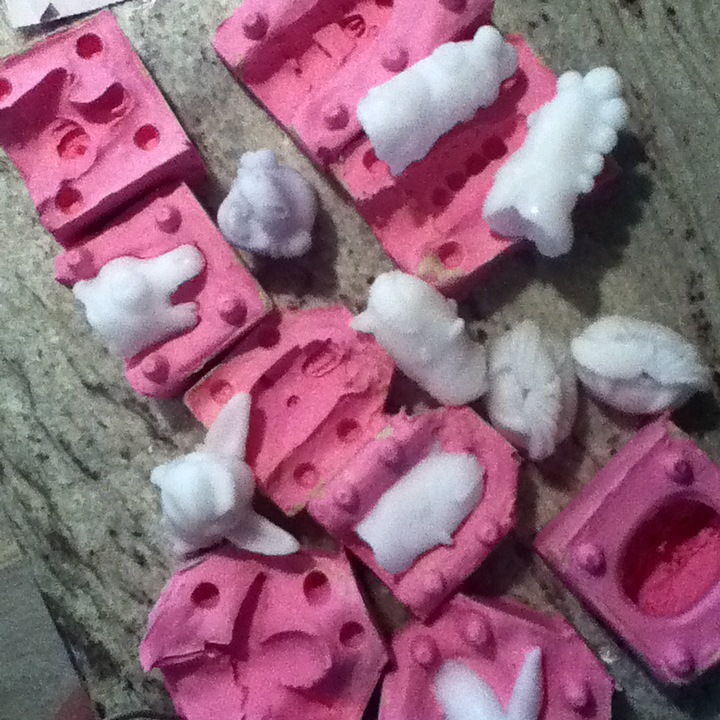 The pink silicone molds with plastic castings. The crocheted bodies can’t be exactly replicated, as nobody (including me) knows the pattern for them. 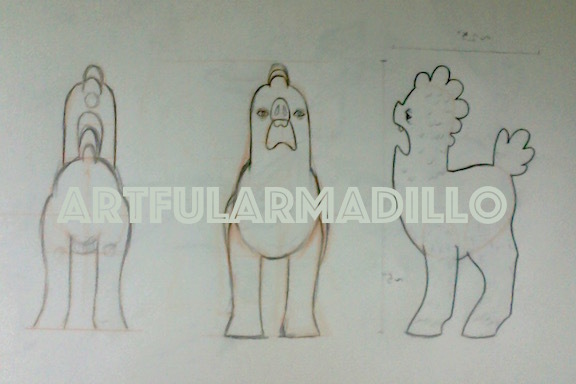 The heads, however, can be almost precisely replicated using the silicone molds, which capture even minute details. I enjoy how tortured these heads look to be all clumped together on each body, like they all went through a malfunctioning teleportation machine. I think I will make separate bodies for some of them and make a few bobbleheads over the summer. I am very much looking forward to experimenting with what I can do with my new skills!